At issue is that the format of Process Modeler is IBM proprietary, BPM-X focuses the integration with BlueWorks using the new, BPMN data format. The BPMN data format is defined by the OMG to allow the interchange of BPMN diagrams. BPM-X has an existing bi-directional integration with BlueWorks using the XPDL format. There is a drawback in using XPDL for diagram interchange: data properties, especially user defined data properties are not exchanged completely using this data format. This means that the data captured by business analysis can`t be simply exchanged by this format. A review of the BPMN format used by BlueWorks shows that the BPMNDI (DI = diagram interchange) data in not enclosed in the exchange XML data. So IBM only shares the BPMN definitions, not the diagram information. When looking to the data properties IBM extended the XML scheme of BPMN by a property XSD (XML scheme definition) for user defined attributes. BPM-X’s solution extended the standard BPMN adapter to fully support BlueWorks Live. The missing diagram information is automatically generated and the data properties are read correctly from the XML exchange file. 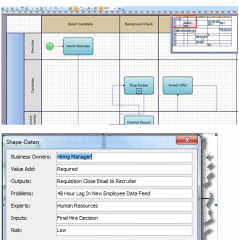 The following figure shows a Visio diagram and the next figure shows the data extracted from a BlueWorks model.